Shri J P Nadda, Minister of Health & Family Welfare said that the Government of India is committed to providing quality healthcare to all, and to ensuring that all have equal access to necessary medicines, with particular focus on the underserved population and marginalised communities. He said this at the function to celebrate five years of Memorandum of Understanding between India and Sweden, here today. 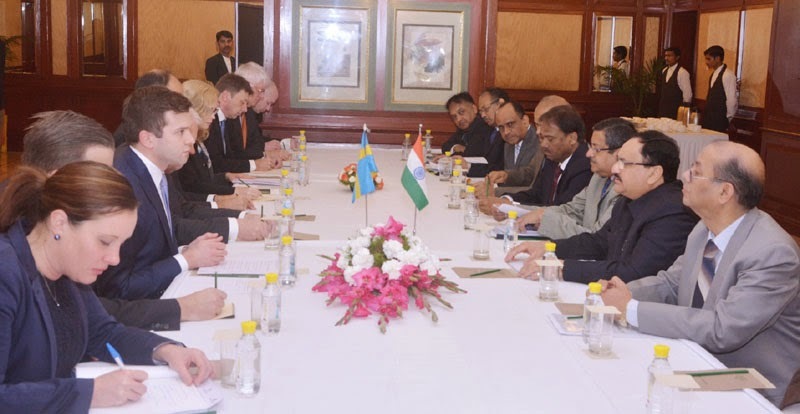 Also present at the function were Mr. Gabriel Wikstrom, Minister for Health Care, Public Care and Sport, Government of Sweden, Mr Lov Verma, Secretary (Health & Family Welfare), Government of India and Mr. Harald Sandberg, Ambassador of Sweden to India. Shri Nadda said that there has been an upswing in the bilateral relationships between both the countries and he looks forward to further deepening of relations between the two. The cooperation in healthcare between India and Sweden will enable filling in gaps in research and innovative technology to aid provisioning of quality healthcare. The Minister stated that there have been appreciable achievements under the bilateral collaboration between the two countries in public heath, R&D, adolescent, mental health and tertiary healthcare. With the thrust on the ‘Make in India’ brand, the Minister said that there are increasing opportunities for the Swedish companies to invest in R&D and innovative healthcare in India. The Health Minister informed the Swedish delegation about the salient features of the National Health Assurance Mission, and commitment of the Government to strengthen the regulatory authorities in healthcare in the country. Mr. Gabriel Wikstrom, Minister for Health Care, Public Care and Sport, Government of Sweden stated that the significant achievements under the bilateral collaboration were sign of deep commitment of both the countries towards healthcare, and the strong relations between the two. It also reflected the political commitments of the two governments, the active involvement of all the stakeholders, he stated. Also present at the function were Dr V M Katoch, Secretary, Health Research; Dr Jagdish Prasad, DGHS and other senior officers of the Ministry of Health & Family Welfare, along with members of the Swedish delegation.